The UFC may be done with former WWE superstar CM Punk as a fighter but that doesn’t mean that he’s done with fighting. The 40-year old mixed martial arts hopeful went 0-2 during a stint with the UFC that dates back several years already after he signed with the promotion following the end of his professional wrestling career. Punk was out gunned in both contests losing by first round submission to Mickey Gall and then barely surviving a three round bout against Mike Jackson back in June. Despite those setbacks, Punk says he has no regrets about signing with the UFC to make his professional fighting debut. “I did things backward,” Punk said when speaking to Newsday. “I jumped in the deep end. But everybody’s path is different. I do think there needs to be a feeder system where people can get their feet wet. Immediately following his lopsided defeat to Jackson in June, UFC president Dana White said rather adamantly that he hoped Punk was done with mixed martial arts. While Punk hasn’t been released from his UFC contract, it appears that his days fighting in the Octagon are probably over but he’s still now ready to give up on his mixed martial arts dream yet. Punk can’t say for certain when — or if — he’ll actually fight again but he’s still training under head coach Duke Roufus and he’s absolutely keeping his options open about returning to the cage again in the near future. 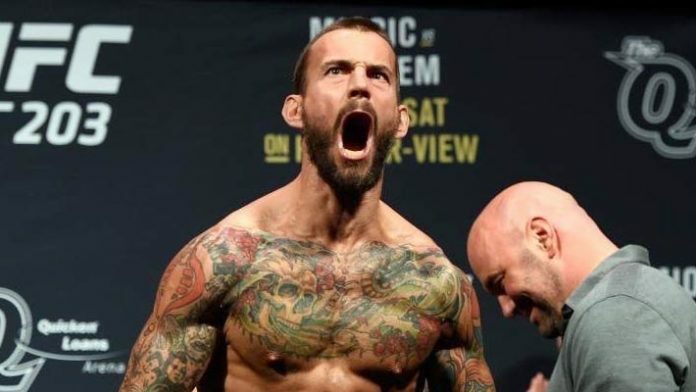 Should CM Punk book another MMA fight? Sound off in the comments and let us know!